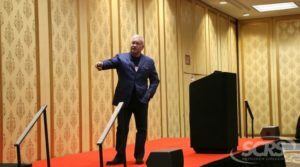 Collision repairers who missed Tracy Law Firm attorney Todd Tracy’s presentation during SCRS’ Repairer Driven Education series at SEMA can now catch the lively talk in a video posted Monday. The Seebachans were traveling in their 2010 Honda Fit on a 75 mph stretch of road in 2013 when a 2010 Toyota Tundra in the other lane hydroplaned into their path, leading to the Fit striking the right front quarter of the Tundra in a T-bone collision. Experts for the plaintiffs said in court documents that the severity of the crash and the Seebachans’ horrific injuries were the result of the body shop adhesive-bonding the Fit’s roof during a $8,500 hail repair in 2012 for the prior owner. The Seebachans had no idea the vehicle had received body work when they bought the Fit, as the CARFAX report only reflected upholstery work, according to Tracy. Honda OEM repair procedures demand a shop tack-weld the front and rear corner edges of the new roof and then perform a combination of two- and three-plate spot welds and MIG plug welds. Body shop director Boyce Willis in a deposition agreed the facility bonded the roof with 3M 8115 adhesive despite little concrete evidence or engineering knowledge to support the decision — particularly as 3M and Honda instructions state otherwise. The litigation brought the concept of shop liability for improper repairs to the forefront of the industry. Tracy’s engaging presentation walks repairers through the evidence against the shop and offers audiences 11 steps to avoid getting sued by a plaintiff’s firm such as his own. A month and a half after the presentation, Tracy made headlines again with his crash-testing of one control and two experimental Honda Fits of the same 2009-13 design generation. The research, conducted at a NHTSA-approved test facility, found increased risk to occupants on a Fit with aftermarket parts and a Fit deviating from OEM repair procedures. Get the full results here. SCRS also now has made available on its SCRSCollision YouTube channel its video of Tracy’s appearance in the SEMA Week discussion of the liability risk to an auto body shop failing to use OEM repair procedures. The rollicking “The Hidden Dangers of Vehicle Technology, Improper Repairs and Your Liability” session also featured noted collision repair attorney Erica Eversman (Vehicle Information Services); Audi collision programs director Mark Allen; and Aaron Clark (Assured Performance), whose former shop Collision Solutions was the target of a lawsuit. Ellis & Associates Managing Director John Ellis moderates. “Understanding the intricacies of the case in Texas, understanding the liability implications as a result of repair decisions, and finding ways to mitigate that liability through good business practice is significant to collision repair business owners and operations,” the trade group wrote in a news release Thursday. Details: Visit www.scrs.com, call 877-841-0660 or email info@scrs.com.